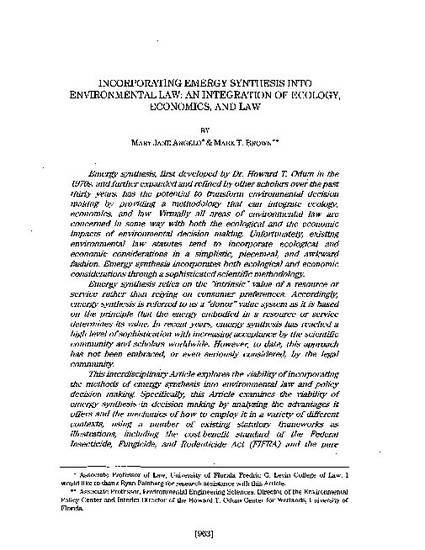 Emergy synthesis, flrst developed by Dr. Howard T. Odum in the 1970s, and further expanded and refined by other scholars over the past thirty years, has the potential to transform environmental decisionmaking by providing a methodology that can integrate ecology, economics, and law. Virtually all areas of environmental law are concerned in some way with both the ecological and the economic impacts of environmental decision making. Unfortunately, existing environmental law statutes tend to incorporate ecological and economic considerations in a simplistic, piecemeal, and awkward fashion. Emergy synthesis incorporates both ecological and economic considerations through a sophisticated scientiic methodology. Emergy synthesis relies on the "intrinsic" value of a resource or service rather than relying on consumer preferences. Accordingly, emergy synthesis is referred to as a "donor" value system as it is based on the principle that the energy embodied in a resource or service determines its value. In recent years, emergy synthesis has reached a high level of sophistication with increasing acceptance by the scientific community and scholars worldwide. However, to date, this approach has not been embraced, or even seriously considered, by the legal community. This interdisciplinary Article explores the viability of incorporating the methods of emergy synthesis into environmental law and policy decision making. Specifically, this Article examines the viability of emergy synthesis in decision making by analyzing the advantages it offers and the mechanics of how to employ it in a variety of different contexts, using a number of existing statutory frameworks as illustrations, including the cost-benefit standard of the Federal Insecticide, Fungicide, and Rodenticide Act (FIFRA) and the pure science standard of the Endangered Species Act (ESA). This Article demonstrates that emergy synthesis has the potential, not only to inform the law, but also to revolutionize environmental decision making by providing a well-developed scientific methodology that addresses both ecological and economic considerations in a comprehensive manner.